NEW YORK–(BUSINESS WIRE)–Acker Merrall & Condit, the world’s premier wine auction house, announced today it will auction two of the oldest and rarest bottles of wine in the world – Champagnes recovered in 2010 from a 19th century shipwreck off the Åland Islands of Finland. This unique auction will feature two single bottles, one each from the legendary houses of Veuve Clicquot and Juglar. These vintage Champagnes, which date to the early 1840s and are thought to be the oldest Champagnes for sale in existence, are among the most exciting discoveries ever in the world of wine. To commemorate this unprecedented event, in the days preceding the auction the government of Aland, which owns the priceless bottles, will host exclusive dinners and tastings showcasing many of the world’s great Champagnes and featuring Richard Juhlin, the world’s foremost Champagne authority, and John Kapon, CEO of Acker Merrall. The auction will take place at Alandica Culture and Congress Center on June 3, 2011 at 3pm EET (8am ET). Bidders can participate in person, via telephone, or on the Internet. Prospective bidders must register for the auction by emailing info@ackerwines.com or visiting www.ackerwines.com/aland. During the summer of 2010, divers discovered unique bottles of champagne in a shipwreck off the Åland Islands, an autonomous region of Finland, at the mouth of the Baltic Sea. The name of the sunken vessel is still unknown, as is its destination, but it is speculated the cargo was bound for the court of the Russian Emperor, Nicholas I, in St Petersburg. 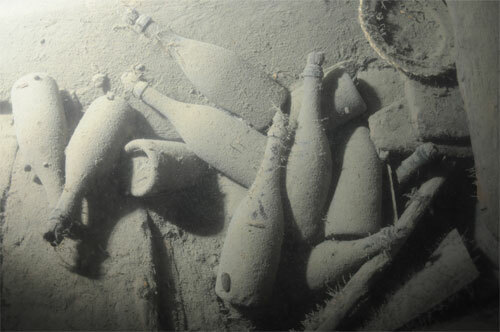 Following a successful salvage operation, it was discovered the bounty included some of the world’s oldest champagnes, wines from the famed houses of Veuve Clicquot, Juglar, and Heidsieck. Founded in 1820, Acker Merrall & Condit is America’s oldest fine wine merchant and the world’s largest fine and rare wine auction house. With operations in New York and Hong Kong, Acker Merrall & Condit hosts over two dozen live and internet auctions annually, and conducts retail operations from its historic headquarters on New York’s West Side. Acker is devoted to helping customers buy, sell, and experience the world’s great wines. That’s pretty amazing. I wonder if the can of Bud Light I found in my basement is still good.